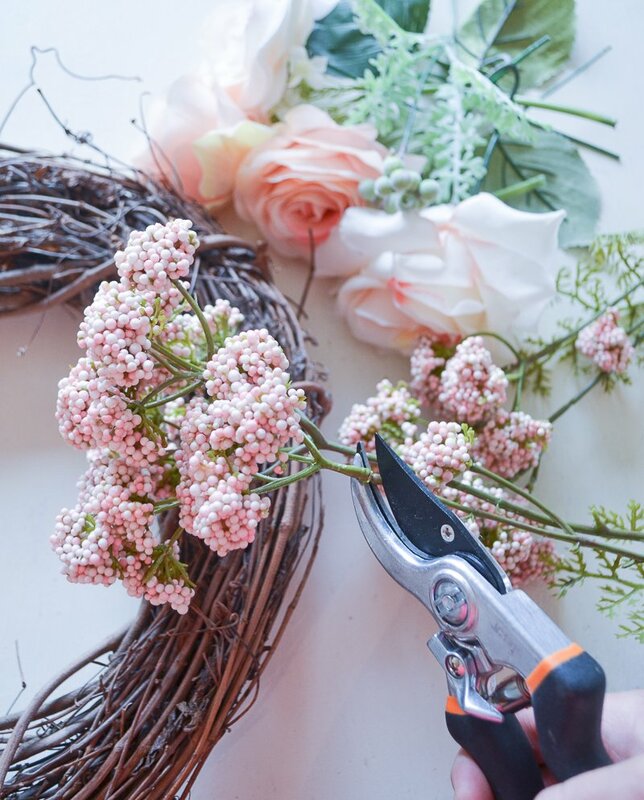 The first step is trimming your floral stems so you’re left with just the top sections. You only need it to be long enough to stick through the wreath. Once that is done just start placing the stems around the corner of the wreath. 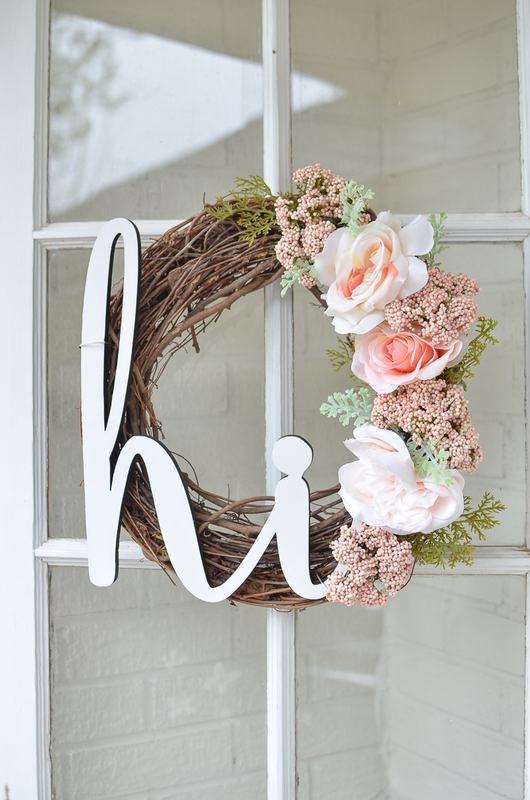 I focused on the right side of the wreath only because I wanted to use the wooded “hi” cutout on the left side, but you can position the stems on the wreath in any way you like. They should all go completely through the wreath so you can see the stem on the other side. I didn’t have a plan for how I wanted the flowers to line up, I just sort of played around with it as I went. I also added bits of greenery too, which were actually already on the stems I purchased, to make it look a little fuller. 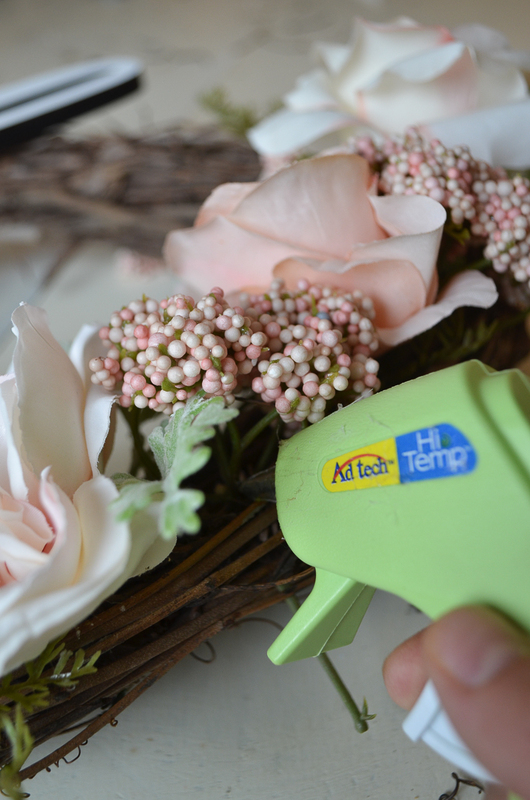 I simply used a hot glue gun to secure all of the floral stems and greenery in place. Then I trimmed any excess off the back side of the wreath. Next it was time to add in the “hi” cutout. 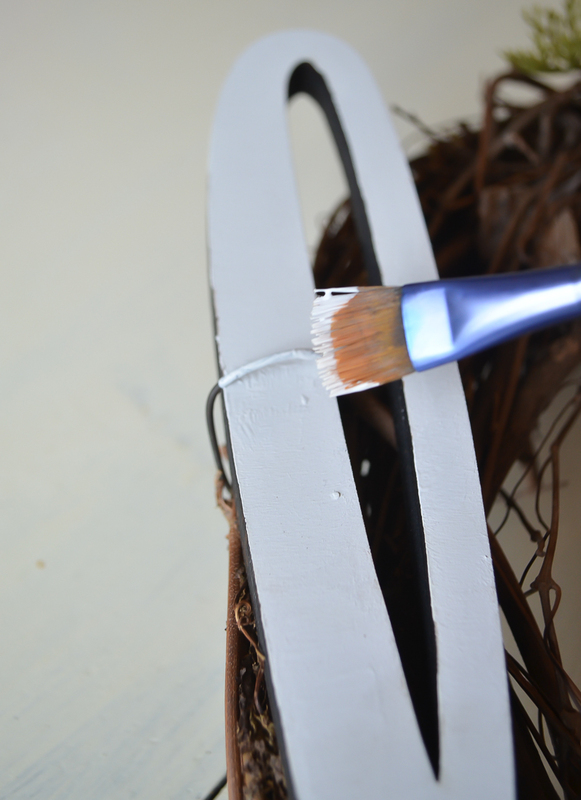 I got mine unfinished, so I put a quick coat of white paint on it before I got started. Then I simply laid the cutout where I wanted it on the wreath and used two pieces of wire to secure it in place. Super duper easy. 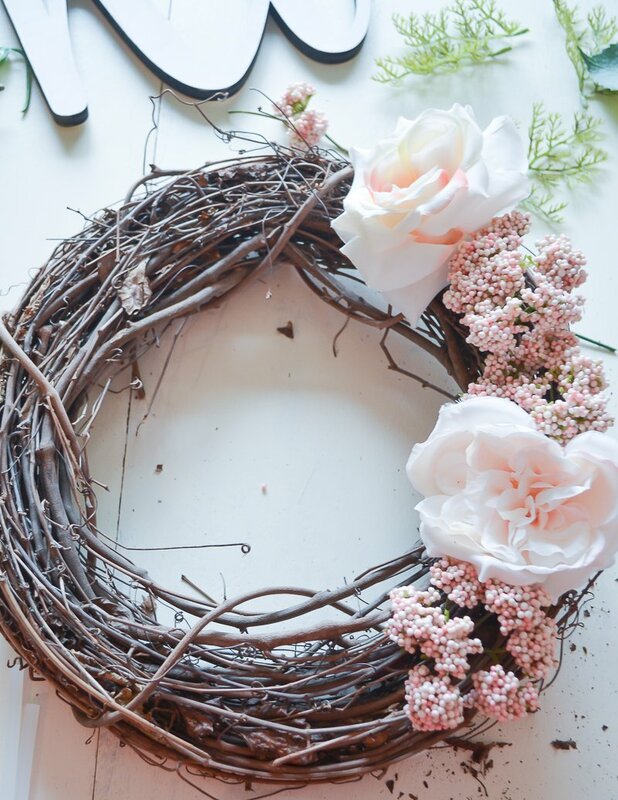 Just make sure it’s nice and tight by twisting the wire together on the backside of the wreath, then tuck it back up inside so the wire is out of the way. I didn’t love how obvious the wire was, so I used white paint to help blend it in. Totally not necessary, but just something extra I did. And now would be a good time to take a sip of that coffee we talked about earlier. Pretty cute, right? 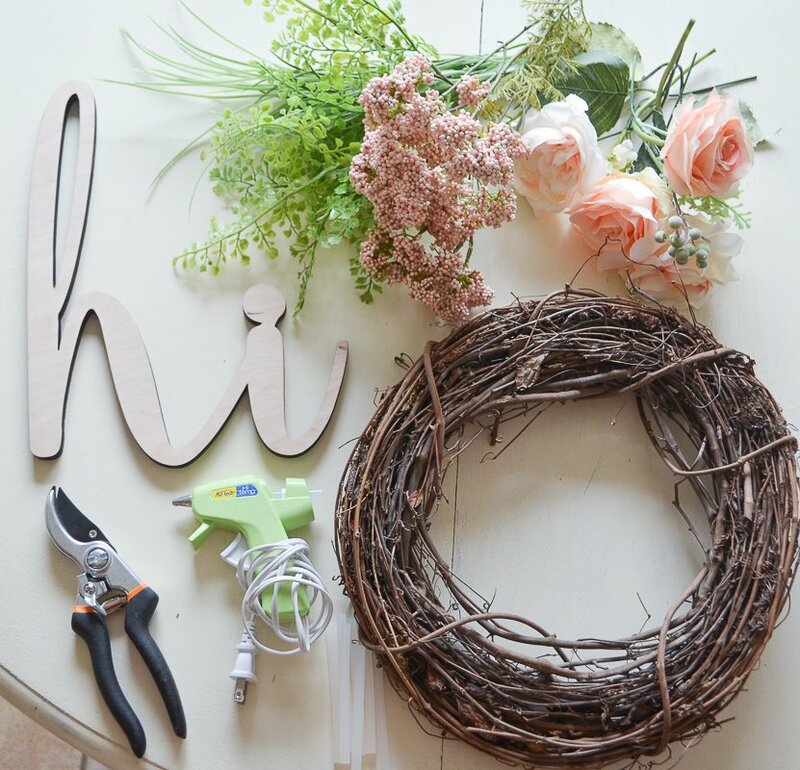 It’s definitely a fun little wreath for the front porch this summer and it was sooooo insanely easy to do. 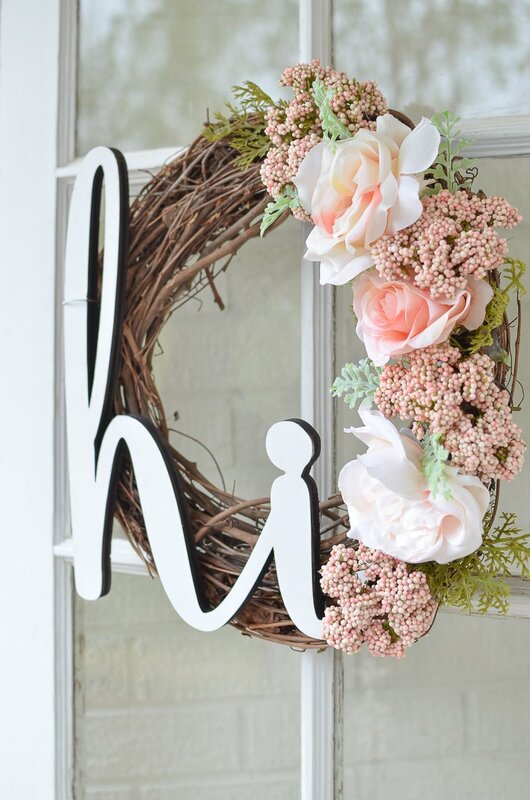 And keep in mind that you could do this with a wooden initial from the craft store instead of the “hi” cutout. Just do whatever your little heart desires! Either way it’s super simple and quick. I think it probably took about 30 minutes, start to finish. It’s the perfect afternoon project. Well friends, I hope you enjoyed this quick tutorial. Of course let me know if you have any questions, I’m always happy to help. 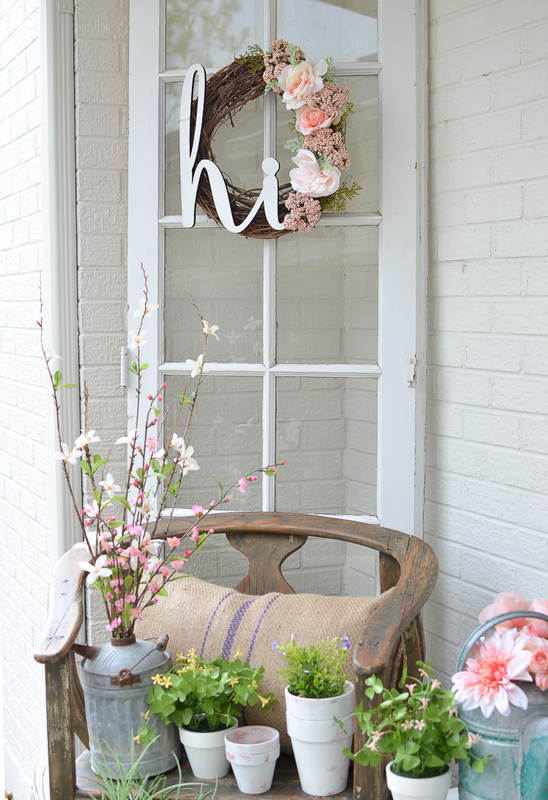 And stay tuned to see the rest of our front porch, I’ll be sharing that post next week! Cute wreath, Sarah. Thanks for the tutorial. ???? Hi Sarah! Your wreath is beautiful…I love the colors. I recently made a wreath for my daughter’s birthday and was trying to come up with an idea to fasten the “S” I used. I, too, didn’t like the look of the wire. I ended up using 2 clear decorating clips by 3M Command. I stuck them on the back of the letter and attached the wire to them. Worked perfectly! Thank you so much for your decorating ideas. You are such as inspiration! So cute -I loved that you used the simple “hi” and I am dying to see the entire porch -the wooden chair has got me swooning and all your little painted pots look so adorable. So pretty and pink is my fave! I remember a long time ago you showing us your porch and the changes you’d made. Post a new pic of the whole thing again! I love that corner – what a welcoming happy feeling. 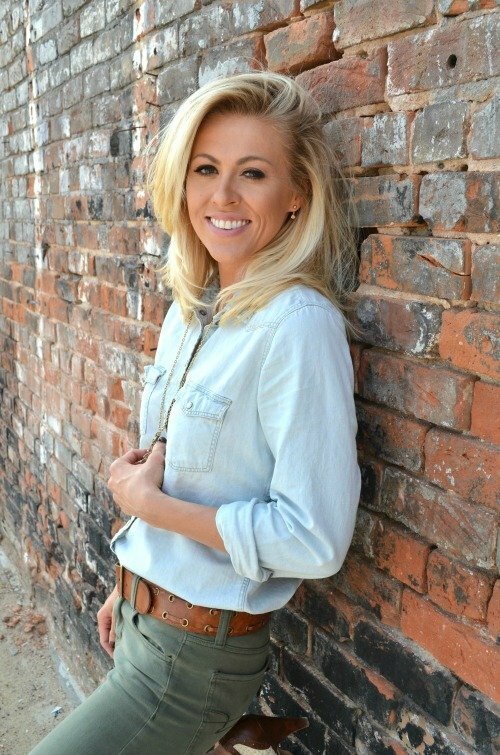 I’ll be sharing this little stoop next week Cindy, stay tuned my friend!! Of course! Thank you for dropping by Gail! Oh dear I love this so much , but for me Im about to head into my winter here in Oz..
Oh I’m sorry Teresa! What is the winter like in Australia anyway? Im from Ireland and living in Australia 5 years now. The winter here in Queensland is pretty much like the hottest day in Ireland. But people get really cold here , i’m still not acclimatized yet so it feels like summer to me LOL!!! Im still finding it hard to adjust to the opposite seasons , ill get there eventually. Hi, love love love this post today. 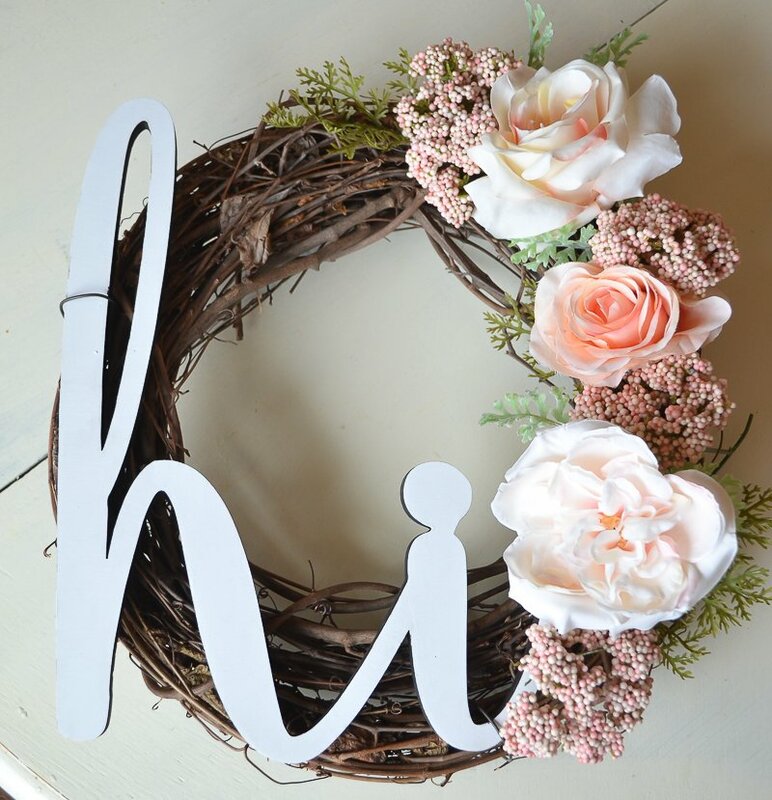 I am making a wreath for my kitchen door and I am using a large wooden letter G (last name initial) in place of your “hi” which i must say I do love. I have been making my door wreaths and even some for inside my house for years. So easy and so inexpensive. Well enjoy your day and Happy Mothers day!!! 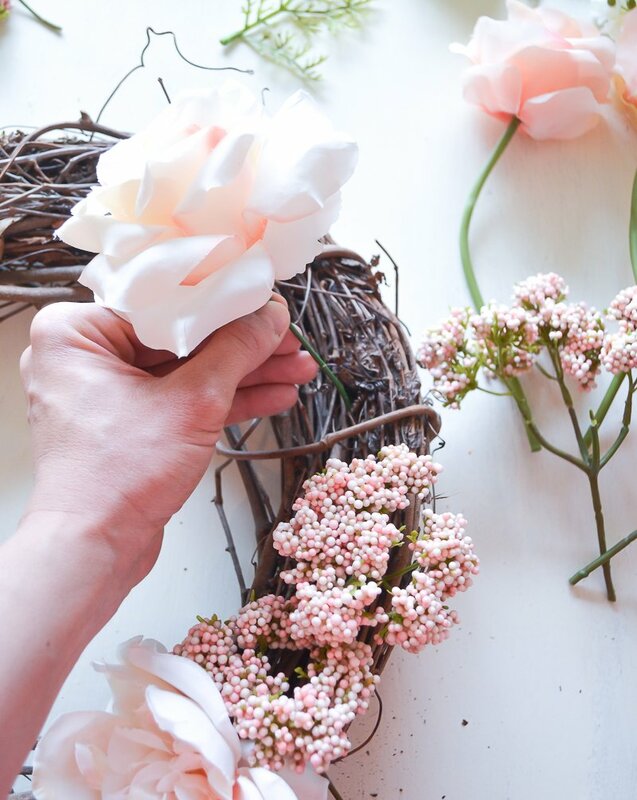 You’re right Tammy, DIY wreaths are so easy and inexpensive. And so fun to put together. Good luck with yours! 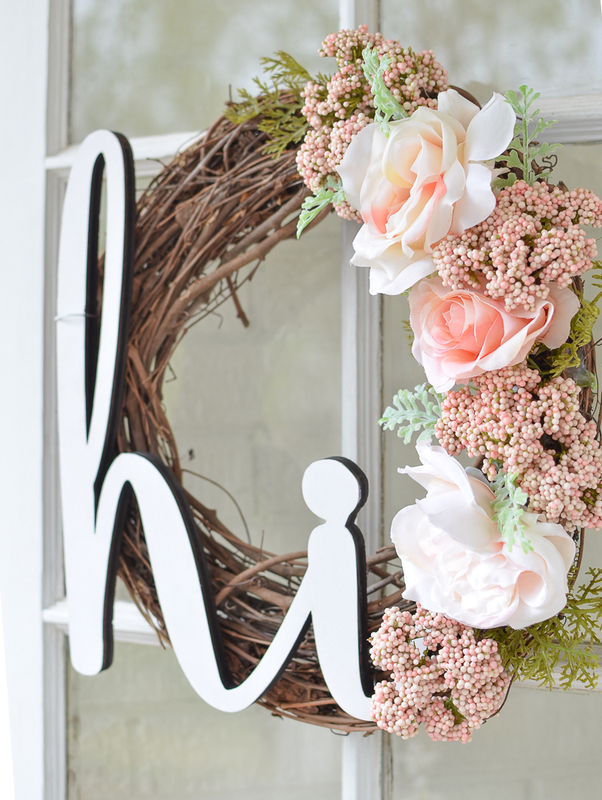 Oh I love this wreath and the colors are beautiful!!!!!!!!!!! I am going to give this a try!! Love all your inspirations and teaching tips! Love the wreath, it’s very pretty. I need to get my summer wreath out and think I will add our initial to it. How much did the supply cost to make it ?? I think maybe $20 or so. 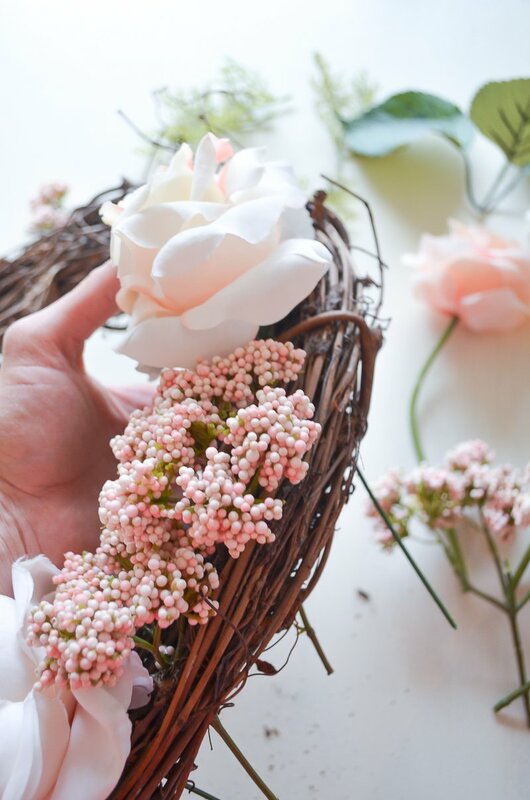 Do you know what kind of “flower” the light pink tiny bundles of buds would be called? I know they’re fake, but what are they? I know it’s been almost a year but for anyone who is still wondering… it’s a berry bush! Where did you get your supplies from, ie the flowers and hi sign?